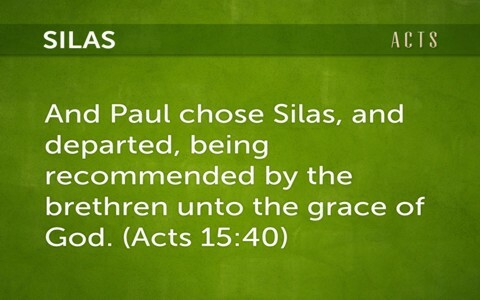 That account mentioned in Acts 16 is probably what Silas was most remembered for, but did you know that he contributed much to the cause of Christ and was an active participant and leader not only in the Church but also on Paul’s second missionary journey (49-52 A.D.)? That journey went through modern-day Turkey starting in Antioch on through Greece and then home. Here are some of the highlights that we find in the Bible about Silas. Read Acts 15:22-40. We first are introduced to Silas in Acts chapter 15 where we learn that he is one of the “chief among the brethren” (a leader in the church). It is here that we learn that he was also one of the “chosen men” to go to the Gentile Christians in Antioch and Syria and Cilicia to speak about how the Law of Moses was not to be observed by the Gentile Christians. Silas, along with Judas Barsabas, was to take this message as a way to back up what Paul and Barnabas had previously told them. The people heard the words of Silas and Judas and then peacefully let them go back to the apostles, however Silas remained with Paul and Barnabas to teach and preach the word of the Lord. Not many days later Paul suggested to Barnabas that they go revisit all of the churches that they had planted during Paul’s first missionary journey to see how they were doing. At this time Barnabas wanted to take his cousin John Mark along as well but Paul was opposed to this because John Mark had abandoned them when they were in Pamphylia (Acts 13:17). Apparently Paul and Barnabas had such a huge argument about it that Paul decided to take Silas with him while Barnabas took John Mark and went on a separate journey. And so began Paul’s Second Missionary Journey with his companion Silas. Acts 17:9–13 And when they had taken security of Jason, and of the other, they let them go. And the brethren immediately sent away Paul and Silas by night unto Berea: who coming thither went into the synagogue of the Jews. These were more noble than those in Thessalonica, in that they received the word with all readiness of mind, and searched the scriptures daily, whether those things were so. Therefore many of them believed; also of honourable women which were Greeks, and of men, not a few. But when the Jews of Thessalonica had knowledge that the word of God was preached of Paul at Berea, they came thither also, and stirred up the people. 1 Peter 5:9–13 Whom resist stedfast in the faith, knowing that the same afflictions are accomplished in your brethren that are in the world. But the God of all grace, who hath called us unto his eternal glory by Christ Jesus, after that ye have suffered a while, make you perfect, stablish, strengthen, settle you. To him be glory and dominion for ever and ever. Amen. By Silvanus, a faithful brother unto you, as I suppose, I have written briefly, exhorting, and testifying that this is the true grace of God wherein ye stand. The church that is at Babylon, elected together with you, saluteth you; and so doth Marcus my son. Silas was indeed a leader and a brave man. He was a man who served the Lord with the gifts he had been given. The apostles loved and supported him and called him “faithful”. He “exhorted” (strongly encouraged) his brothers to do right (Acts 15:32). His enthusiasm allowed him to spend extra time in Corinth, even after Paul left that city. He must have been a great companion! More for you to read: What Were Paul’s Missionary Journeys? Previous post: Should Christians Judge Others Outside The Church?